Treyarch has announced two massive changes to League Play and competitive Call of Duty. Firstly, specialist abilities and weapons will now be generated by in-game score only, with no time-based progression. 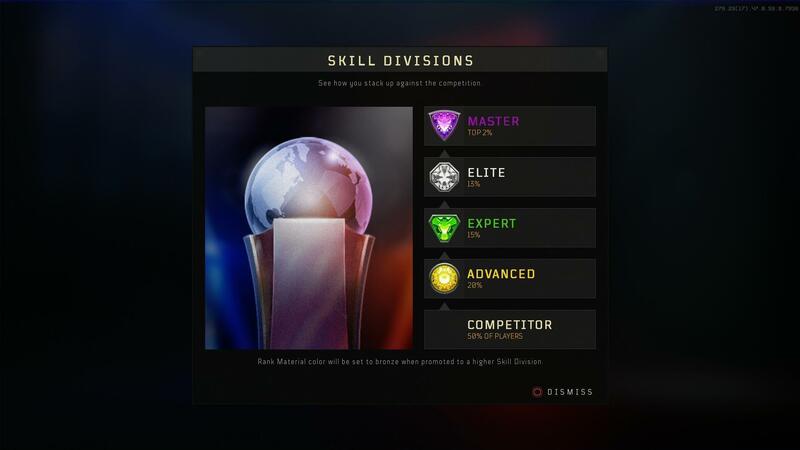 Secondly, skill divisions finally made their way to league play, offering a pseudo-skill based ranking and matching system for Call of Duty: Black Ops 4 players. Ever since specialist abilities and weapons made their way to Call of Duty games in Black Ops 3, the professional community has clamored for them to be earned as a reward based on performance, not time. There have been several instances where players have had 1 or no kills and received a game-changing specialist late in a map that altered the course of a tournament. However, there has been significant developer pushback to score-only based specialist progression. By adding time-based progression in addition to score-based progression for specialists, weaker players with less score will actually have a chance to use their specialist in a match. This significantly enhances a casual fan’s enjoyment of the game. In competitive Black Ops 3, specialist progression involved both score and time, whereas in competitive Infinite Warfare, it involved only score. Treyarch’s compromise with this patch will keep time and score-based progression in regular public matches, aiding the casual player. However, specialist progression in competitive modes like League Play and the Pro League will be entirely score-based. Early testing by the professional community has yielded the current score threshold for earning specialists. Ruin, Battery, Prophet, Crash, and Zero will require 1700 score. Firebreak will require 2200, Seraph will require 2400, and Recon will require 2550 score. An important aspect about these score thresholds is that as of now, they apply to all game modes. Scores like Recon’s 2550 threshold, while common in Hardpoint, are somewhat rare in Search and Destroy. This will require teams to adjust their specialist selection in different game modes. Moreover, specialists, will generally be less common in Search and Destroy, a consequence most competitors are rather happy about. Roughly 2 months after initially releasing League Play, Treyarch has introduced their League Play formal ranking system. This ranking system includes an updated tier list for the placement of League Play players. However, there are still several questions and concerns about the game mode after this update. Firstly, the League Play progression system seems to be implemented on top of the existing ladder system. This system breaks down all competitors into smaller groups of players and ranks them in that group rather than the whole population. Moreover, Skill Based Match Making remains the greatest desire among League Play players, and as of right now, it does not appear to be fully implemented in the game. While some have reported matching with players with tiers closer to their own, others have had the opposite experience. Unlike Call of Duty: World War II’s ranked play system, there does not appear to be an MMR rating for each player that dictates matchmaking. Nevertheless, it is still very early in Treyarch’s League Play implementation. Over time, rankings will be developed from a larger sample size and become increasingly accurate. Treyarch will also surely modify the system to provide a more robust League Play experience as the year goes on.